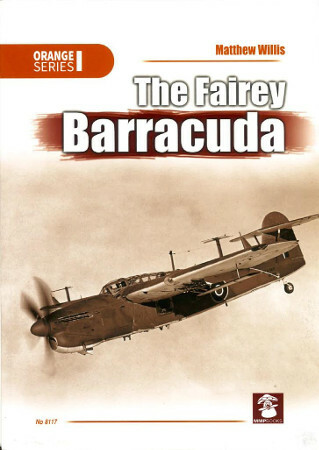 The first line of the introduction to Matthew Willis's history of the Fairey Barracuda in Mushroom Model Publication's Orange Series reads, "The Fairey Barracuda stands among the most reviled aircraft of the Second World War." That's laying the cards on the table right from the start. The Barracuda has a poor reputation, but it also has some points in its favor. The Barracuda was the most widely produced British naval aircraft ever built (a fact that could probably win you a trivia contest or two), and it remained in Fleet Air Arm service until 1953, which indicates that it wasn't seen as utterly useless. Willis's previous book on the Blackburn Skua and Roc managed to show that the Skua was actually a successful aircraft given its inherent limitations (nothing could redeem the Roc), and much of the material in his book on the Barracuda serves the same purpose, although it's harder to get a handle on the aircraft. The consensus on the Barracuda is that there's little consensus at all among the recollections of those who flew it and worked on it. Willis interviews many ex-aircrew and ground staff, and discovers that for every one who hated the aircraft, and some hated it with a passion, there was someone that actually liked it. One pilot recalls that he had the task of taking several aircraft for test flights after maintenance, and discovered that it was fully aerobatic, in direct contrast to what the Pilot's Notes claimed! The Barracuda was handicapped by having the engine it was designed for, the Rolls-Royce Boreas, cancelled before the aircraft flew. Forced to use the Merlin as a second choice, most pilots found it underpowered. It was criticized in Parliament before it even entered service, and suffered some fatal crashes early in its career that established its poor reputation. The more powerful Griffon-engined Mk.V was a much better aircraft, but didn't make it into service before the end of the war, and only 30 of that mark were built as the production contracts were reduced after VJ Day. It was also one of the more ungainly looking aircraft of WW2, with a stalky undercarriage, and a high wing and tailplane that didn't help its appearance. Yet the Barracuda's actual combat record was quite good – during its raids on the Tirpitz it recorded more hits than the Royal Navy assessments of the time gave it credit for, and it performed well during raids against Japanese targets in Sumatra. It was regarded as having excellent qualities as a dive-bomber. The Barracuda saw post-War service as an anti-submarine aircraft, and in its only use in non-British service, a handful served with the French until 1954 conducting espionage behind the Iron Curtain! Willis navigates all of these contradictory facts well, providing a good mix of technical information on the aircraft and its development, and quotes from those who used the aircraft in service. The large A4 format of the book works well in allowing the photographs to be printed in a way that detail can be seen, and the collection of photographs, from both official and private sources, is exceptional, even if that means we get fairly non-essential photos such as one of the Commanding Officer of an anti-submarine research unit eating his Christmas dinner. One of the most disheartening things in the book is a sequence of seven photos showing a Barracuda being disposed of by pushing it off a Scottish cliff – disheartening because although it was, as mentioned, the most widely produced British naval aircraft, none were kept for preservation. The Fleet Air Arm Museum is attempting to rebuild an example from the remains of several wrecks, as the book details, but it's clear this will be a long and difficult project. The lack of a complete example in existence also makes it impossible to do a modern set of walk-around photos. Vintage close-up photos are included, as are those of the partial restoration, but understandably they're not as complete as they would be if a museum specimen was available. The large format also works well with the graphics. There are six pages of 1/48th and 1/72nd scale drawings by Dariusz Karnas, and fifteen pages of excellent color profiles by JP Viera. This book provides a fine overview of an aircraft that has been overlooked in WW2 aviation literature. It's a welcome addition, and is highly recommended.